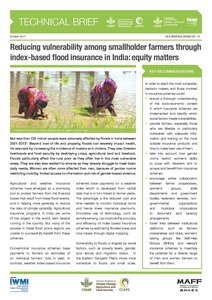 The Index-based Flood Insurance (IBFI) project, led by the International Water Management Institute (IWMI), aims to develop remote sensing products for IBFI that can accurately depict yield loss due to adverse weather and other disasters on smallholder farms. The overarching goal is to help smallholder farmers better manage their production risks and thereby help contribute to a more secure future for farmers in India. Once these remote sensing products are developed, tried and tested the team aim to ensure that they are scalable to enable them to be used effectively in large scale insurance schemes.